The Racing Times (AROUND THE TRACK): COLIN HALEY THE "PEOPLES RACER"
COLIN HALEY THE "PEOPLES RACER"
For Colin Haley (Ashford, CT) it started at the age of eight at the Stafford Motor Speedway in the Tiger Sprints. Even though he had many wins and successful seasons, it was all about learning the fundamentals of racing. So as Colin makes the transition in racing, so did the knowledge of racing. His skills in the Junior Outlaws Karts showed just that as he now makes the Legends division his new home. Colin like many races got hooked as soon as he was exposed to it at the Stafford Motor Speedway. So with the knowledge he gained, the success started showing in his finishes. 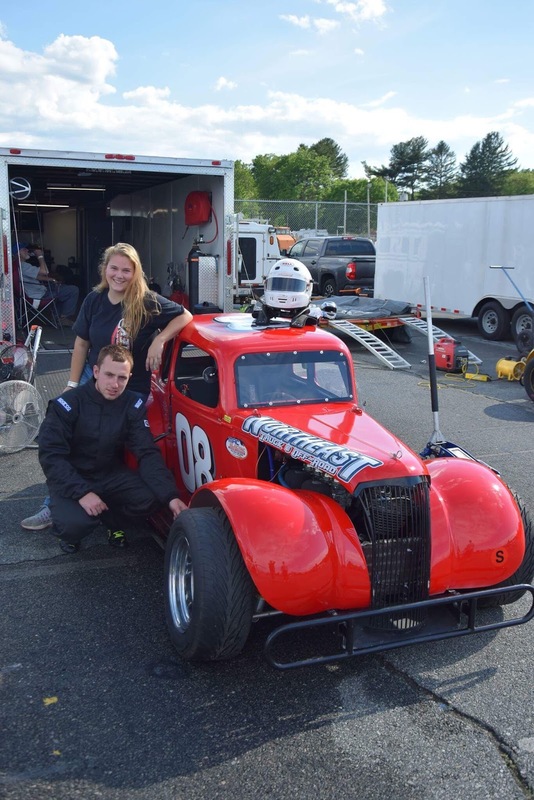 For Haley what he thrives on is the people around him that enjoys racing as much as he does. Looking around the pits it's hard to find a more passionate person in the sport that he loves. But what impressed me about Haley was how dedicated he was, not just with racing but in life. Colin is in his second of a four year electrical apprentices (with Mac Electric in Coventry)but he's looking to get his masters in electricians license so an additional two years will be included to his career goal. With his career being his main priority, Colin also knows to be competitive on the track, you need time in the garage to get things ready. So for Haley all his extra time will be spent in the shop with his car. As time may be limited for Colin on some weeks in the shop, he does have a major contributor. That help comes from his girlfriend, Morgan Keegan. During the week its not uncommon to find her under the car changing gears or making spring adjustments. Throw in the regular maintenance and the cars set-up, its a full week for Morgan. Usually when you ask a driver about his most memorial moment in racing its usually the wins or championships that comes up, but for Haley its all about the young fans. For the young fans that stops by to see Colin's car he always invites them to go and sit in the car. So what is Colin's most memorial moment in racing? Seeing the smiles of the young fans as they exit the car. This is why Colin's pit stall is one of the most popular stops on race day. 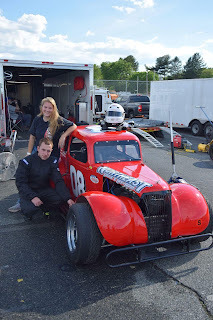 For Haley (whose 19-years-old) is starting his fourth year at The New London Waterford Speedbowl in the Legends division. The only question that he needs to figure out before heading to the track is which car to bring with him. Haley has a red and blue 34 Ford Couple numbered #08 at his disposal. 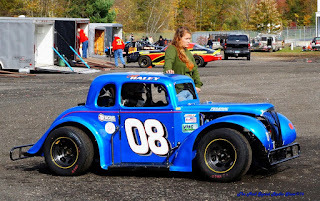 Both cars have Inex chassis and powered by 600 Racing along with sponsorship from Mac Electric (Coventry, CT) as well as Northeast Truck and Off Road (New London, CT). Colin wanted to explain just how important Todd MacDonald is not just to his team but in life. "Todd has been very special to me as he's the one giving me the chance with the apprenticeship but includes me in many family functions and is responsible for the horsepower under the hood," Haley explained. Also his second sponsor Jeff Mazzella from Northeast Trucks and Off Road is responsible for the truck suspension upgrades as well as accessories to haul the car to the track, not only once but Haley may run twice (Wednesday and Saturdays) during the week at The Bowl. When Colin is away from the track you can find him either riding his motocross bike or fishing and in the winter months snow boarding. If time allows Haley likes to travel to near by states to check out other forms of racing like the Midgets, Sprints and Modifies run on dirt. For the 2017 season the team has set up realistic goals, winning or finishing up front is really not important, but I'm sure sitting in victory lane a few times will change that, but running the best he can do with the car. But the main factor is being about the team and lastly having fun. So with no pressure on Haley he can just go out and have fun, which most likely put him into victory lane. So for Haley its all about family and friends, which is the main ingredient to a successful season. If your ever in the pits, stop by the #08 and check out his car. Colin will be easy to spot, he's the guy with the smile from ear to ear.